Relativistic Kill Vehicles are a staple of space opera. The idea is simple — impart enough kinetic energy on your projectile, and make sure that energy carries it into something or someone you don’t like. Upon impact, the energy is shared between the projectile and the target, and much of it will go into remaking the target into a form you find more pleasing. The interesting properties of RKVs all involve observation. Detecting an RKV is often very difficult — since terminal guidance is virtually impossible for them, they don’t expend a lot of thrust near the target, and therefore pretty much just reflect signals rather than emitting much of their own. Also, because they are traveling at a significant fraction of the speed of light, they have moved considerably by the time they are detected in a particular location. Let’s take the scenario presented in yesterday’s video: six RKV’s enter the Sol system. Each is 1 ton traveling at 0.5c relative to Earth, their target. At that speed, relativistic effects are noticeable, but not extreme — the observed mass of each object from locations in the solar system is about 1.15 tons, not incredibly more than the projectile at rest. Let’s presume for the moment that Earth has the ability to detect an object the size of that projectile as far out as Neptune (~30 AU.) Since there’s minimal radiation from the object itself, let us also assume they’re using active radar to detect it. The fastest line of communication is a straight line, so let’s further presume that that radar station is on or near Earth. The radar beam is pretty quick — it will bounce off the RKV as soon as it enters detection range, because it is always being sent out. The return, though, has to come from 30 AU all the way back to Earth at 1 AU, which will take about 4 hours. In those 4 hours, the RKV’s are closing in — when the radar return reaches each, the RKV’s are now 14.5 AU closer than they were — already inside Uranus’ orbit and only 4 hours from impacting Earth. Because Earth is in the cross-hairs, this trend will continue until impact — the RKV will always be half the distance to Earth that the most recent returns say it is. In the scenario depicted in the video, Earth attempts to defend itself by using Mass Drivers location on the Moon and in Australia to throw hunks of raw minerals in the path of the on-rushing RKV. Mass Drivers are fascinating devices of almost mythical ability depending on where you hear about them, but for our purposes, they accelerate heavy objects up to orbital velocities in a controlled way. They are essentially space guns that shoot big rocks. Escape velocity for the Sol System from Earth’s orbit is about 41 km/s. There’s really no reason a Mass Driver on Earth would ever need to throw much harder than that, so I take 41 km/s to be the “muzzle velocity” of my defensive guns. I give them each a payload size of 100 tons, which is couple of cubic meters of some reasonably heavy metal they don’t care too much about. Each of these chunks of rock is bestowed with about 8.4 x 10^13 joules of energy. Some of it will be lost to gravity by the time they intercept the RKV, but for now let’s use that number. Assuming the first shot comes off the drivers at T-4 hours exactly they will have made it to about 590,000 km by the time they reach the RKV and have a chance of hitting it. At this time, the RKV is four seconds from hitting Earth. To save the Earth, the first ore packet would need to slow the RKV down to less than 1% of the speed of light. Unfortunately, even if it connects with the target, it will only have a fraction of the necessary energy. The blow would certainly change the RKV’s course, cause a different spot on Earth’s surface to be hit and reduce the final impact energy, but it wouldn’t come close to diverting it from slamming to the Earth with an energy release of about 3 gigatons. Today is a very exciting day! There are not one, but two videos for our fans. They are both about how Lightspeed Communications work in Slower Than Light. One is a two-and-a-half minute summary that quickly goes through the gameplay implications. The second is an eighteen-minute live commentary as I actually played the demo, going over how I was doing everything. Why did I make this second video? Because I’m making the demo available on this website for download, so that both current and prospective backers and experiment with and experience how light-speed communications will work in Slower Than Light. This is a very exciting day for the Slower Than Light project, and I hope that you find the content here both exciting and informative. Today is the first of two parts talking about how the time delay in Slower Than Light works. Today I’m going to be writing about how signal strength and distance are abstracted, and how those create interesting interactions. Tomorrow there will be a video using one of STL’s prototypes, as well as a special surprise. I know I’ve been accused of being obsessed with numbers in some places, and this post isn’t going to help that impression. If you’re just looking to see the mechanics in action, you can skip this post entirely and just watch tomorrow’s video when it goes up. The basis of the way information flows around the galaxy in Slower Than Light is electromagnetic signals that move at light speed. Every signal in the game has two properties relevant to its propagation: the location it originated from, and its strength. Signals get weaker further from their source by the inverse square law. To make math easier for users (and developers…) the base signal strength of each transmitter is its strength at 1 light-year from the source. That is to say, if a transmitter on a colony or a starship has a stated strength of 100, the signal will have a strength of 100 one year later when it reaches 1 light-year’s distance from the source. It will have a strength of 25 when it reaches 2 light-years away a year after that. By the time it has traveled 10 light years, it will have only a strength of 1. 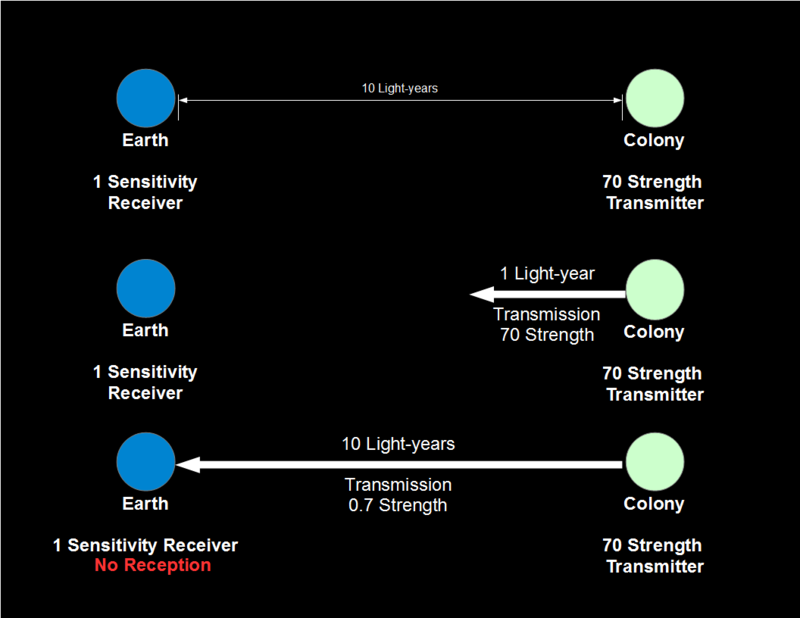 Figure 1: A transmission system sent from Earth with a strength of 100 can travel 10 light-years, where it will have a strength of 1. A receiver with a sensitivity of 1 can receive that signal and process or forward the message it contains. The second component of the system is a receiver. When a signal reaches a receiver, if the receiver’s sensitivity is lower than the signal’s strength, it can read and decode the message and either update its own database or forward the message along. Because transmitters and receivers can have different ratings on different planets, it is entirely possible for a colony to be able to hear another settlement, but not be heard by them. 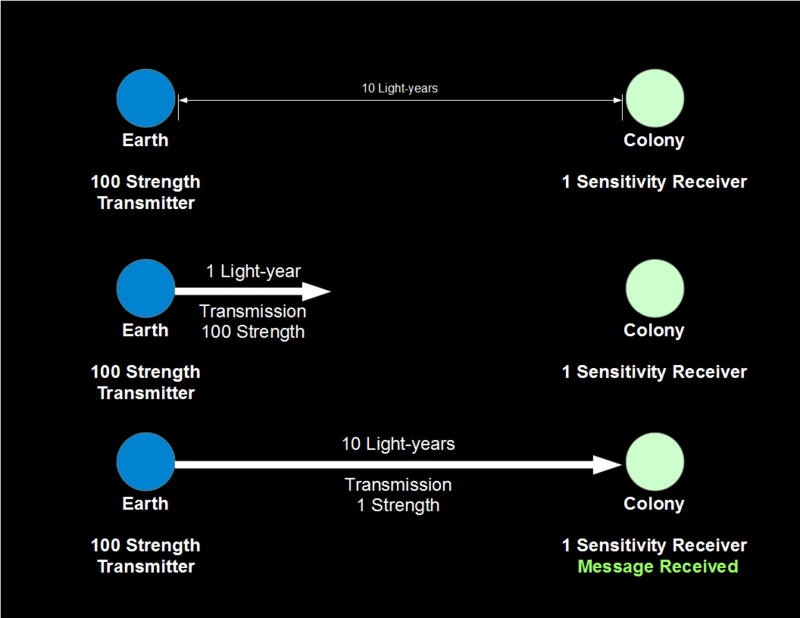 Figure 2: The colony attempts to send a message to Earth (10 light years away) with its strength 70 transmitter. The signal degrades to 0.7 strength by the time it gets to Earth, though, preventing Earth from receiving the message. Figures 1 and 2 show how this relationship works. Earth here has a 100 strength transmitter, while the colony 10 light-years away only has a 70 strength transmitter. Both have a 1 Sensitivity receiver. 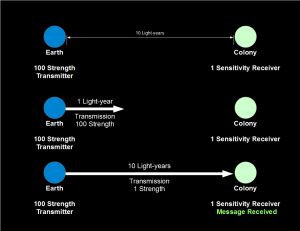 If Earth sends a message to the colony (Figure 1), the signal strength is reduced to 1 by the time it arrives(100 Strength divided by 10 lightyears squared), but since the colony has a receiver with a sensitivity of 1, it can receive the message from Earth. If the colony then attempts to respond, however, its message starts with a strength of 70, and by the time it reaches Earth it has been reduced to a strength of only 0.7, which is less than Earth’s receiver’s sensitivity, so Earth cannot hear the reply. 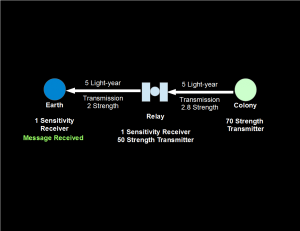 Figure 3: The Relay receives the signal from the colony, and retransmits at a strength of 50, allowing the signal to reach Earth. We resolve this communications gap with transceivers, devices that receive and re-transmit messages. 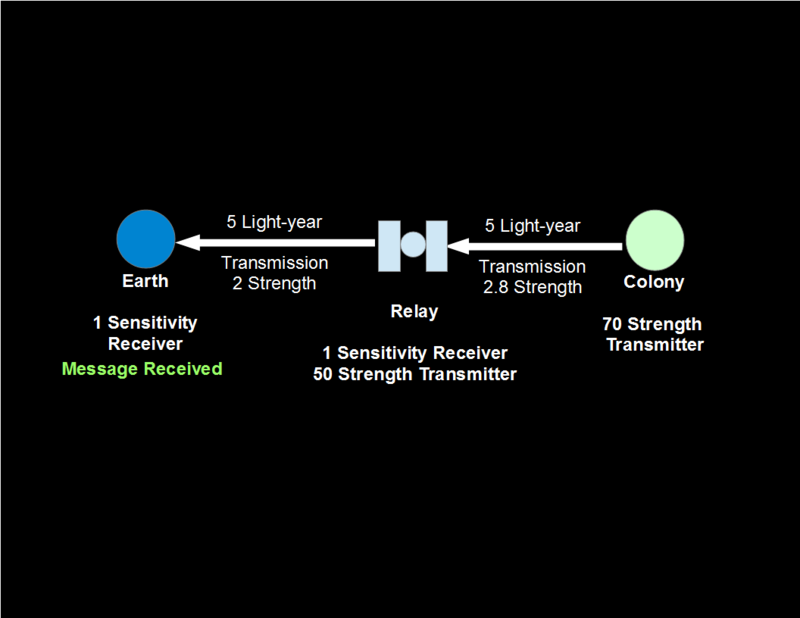 In Figure 3, a relay spacecraft with a transceiver has been place between Earth and the colony. The relay has less transmitter strength than either Earth or the colony, but when it has the same receiver. When the colony’s signal reaches the relay, it has only degraded to 2.8 strength over the five light-years, so the relay can receive it. The relay then re-transmits the message to Earth with a strength of 50. Over the 5 light-years to Earth, the signal degrades down to a strength of 2, but is still easily receivable by the homeworld. 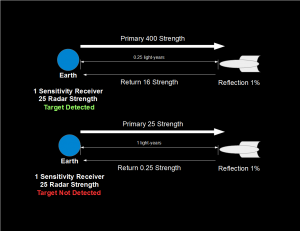 Figure 4: Deep Space Radar with a strength of 25 can easily detect a spacecraft with a reflectivity of 1% at 0.25 light-years, but not at 1 light-year. Deep Space Radar also uses the signal medium, but slightly differently. 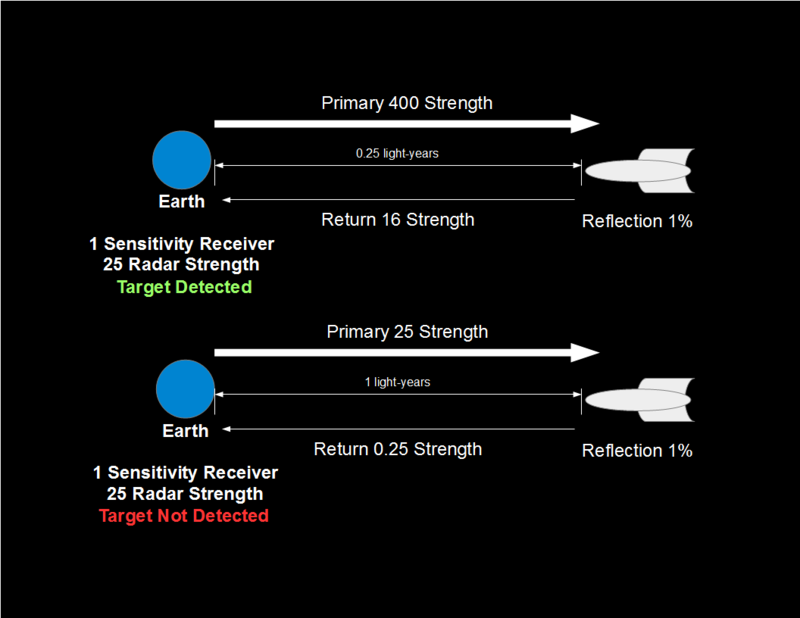 Each spacecraft in STL has a reflection percentage, an amount of signal strength it naturally reflects. Deep Space Radar sends out a powerful pulse, and every spacecraft reflects a small fraction of that pulse back, called the “return”. If the return is still strong enough to be detected when it returns to the point of origin, the target can be detected, and some information about its size, position and velocity can be derived. Finally, the signal system is also used to collect information on other events that might be detected. Ships firing certain types of engines to accelerate and deccelerate might be visible to colonies in the same star system. Detonations of large weapons either planetside or in space would also be visible at some distance. Some natural sources produce signals that can interfere with near-by transmitters and receivers. Finally, most megaengineering projects will make a lot of noise on the electromagnetic spectrum. Knowing how these signals move around the galaxy is important, but what does it mean for gameplay in STL? At a basic level, signals come in two flavors: Normal and Urgent. Normal signals are just regular updates on the locations of ships, the demographics of colonies, the status of production orders, that sort of thing. When they arrive, the player’s interface is silently updated to reflect the new information. Urgent signals indicate something that happened that may require the player to intervene. For instance, when a new spacecraft is detected, that is considered an urgent signal. If the game were processing turns, it would immediately stop, give the player that message, and return them to the home screen to give orders. When a new colony first makes contact, that is an urgent signal. If a distress signal is received, that is an urgent signal. All the normal messages you would expect a game to call your attention to are urgent signals. Orders the player gives are also signals. If the player needs to order the colony from Figure 1 to build a spacecraft, the order will take 10 years to reach the colony, at which time construction will begin. If it took 2 years to build the spacecraft, the completion report would arrive back at Earth 12 years after that (22 years after the order was originally sent), and the orders for the ship would then take another 10 years to reach it from Earth, meaning that from the time construction was ordered to the time the ship received its orders would be 32 years. Of course, with STL it will be possible to send a mission along with the ship construction order so that it would only take 12 years for the ship to be built and assigned orders, but without foresight, the unwary can quickly find themselves with a many-decades-long construction process. 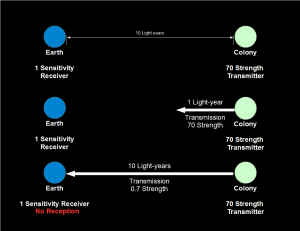 Figure 5: Despite Earth and Colony 3 being only 3 light-years apart, their transmissions take 30 years to reach each other because they must be relayed through Colonies 1 & 2. Each colony acts as a relay automatically, so if make sure all of your colonies can talk to at least one other colony when they’re founded, you’ll have a connected network of planets that can all send messages to each other. It might not be the most efficient method, though. 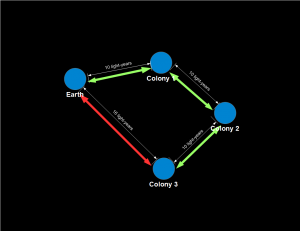 In Figure 5, we have Earth attempting to communicate with Colony 3. Using the values for Earth, colonies, and relays given above, each world can send and receive messages to planets within 10 light-ears. Earth and Colony 3, though, are 16 light years apart. To get messages back and forth, they need to relay through Colony 1 and Colony 2, and each stage of that journey takes 10 years. Thus, when Colony 3 sends updates to Earth, they arrive 30 years later. With a string of relays across the void between Earth and Colony 3, that time could be cut down to a bit over 16 years. Wow! That was nearly 1,300 words about the way signals work in Slower Than Light. If you read all that, congratulations! You’ve gone above and beyond. If you just skipped down here, don’t worry — I’ll be posting a video tomorrow demonstrating everything above to help make it clearer and help you see how these mechanics will actually play.